Well, I forget to complete my post by midnight. Arlana and I went awol from SSW the past two days. 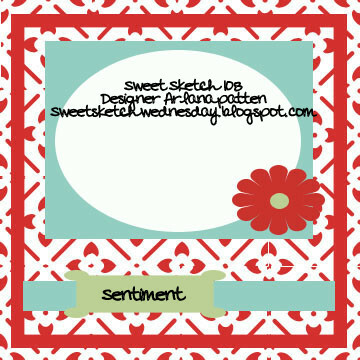 We have been so immersed in making mini albums that we totally forgot about SSW! But here it is Wednesday morning at 2 a.m. We are trying to complete our eleven albums before I return home. I've had a wonderful week with Arlana and Nancy. Sisters are meant to spend time together and boy did we have fun this time! Thanks Arlana and Nancy! You're the best! Well, you will love the sketch this week! Bugaboo is our sponsor at SSW! Yes, we love Jodi's images! I would love to get inside her mind to see how she works! I am always amazed at her creations and they never seem to end! Jodi is offering 7 free digis to our lucky Grand Prize Winner at Sweet Sketch Wednesday this week! Wouldn't you love to choose 7 free images? Just play along and you will have a chance to win! Be sure to stop by SSW to see the fabulous creations my team mates have created for you! Hi Judi, I think your having far too much fun at Arlana's 2am in the morning I don't know??? Well it's only 12.20am at present whilst I am trying to get some of my commenting done. I know your minds not on the job Jodi is offering 7 digi's not 6 you know what I told you before you left behave yourself. Love your card this week very cute what an awesome kids birthday card. Love your colours your design papers are just perfect and I love how you glass coated the balloon very pretty. Have fun and enjoy your time together. If these were all girls in your image, it could be you three sisters partying this weekend. I am glad you all had such a wonderful time and got to craft together as well as all the other fun things. 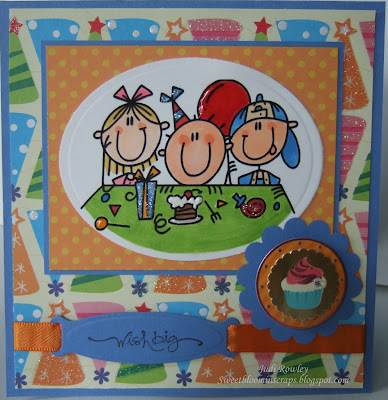 This is such an adorable card with the matching party hat paper. Have a great week. I love this image and you have really brought it to life. It is so adorable. Your papers and bright colors are perfect. Thanks for everything this weekend. It was so fun to be together and it really renewed my spirits. Thanks for all you do. what a fun cheery card! lovin that image...so adorable! nice touch with the cupcake and glitter! awesome work chickie! Judi, this card simply oozes funness!!!! So bright, so happy, so adorable! Speaking of fun, sounds like you three sisters had a blast!! Enjoy the rest of your week! 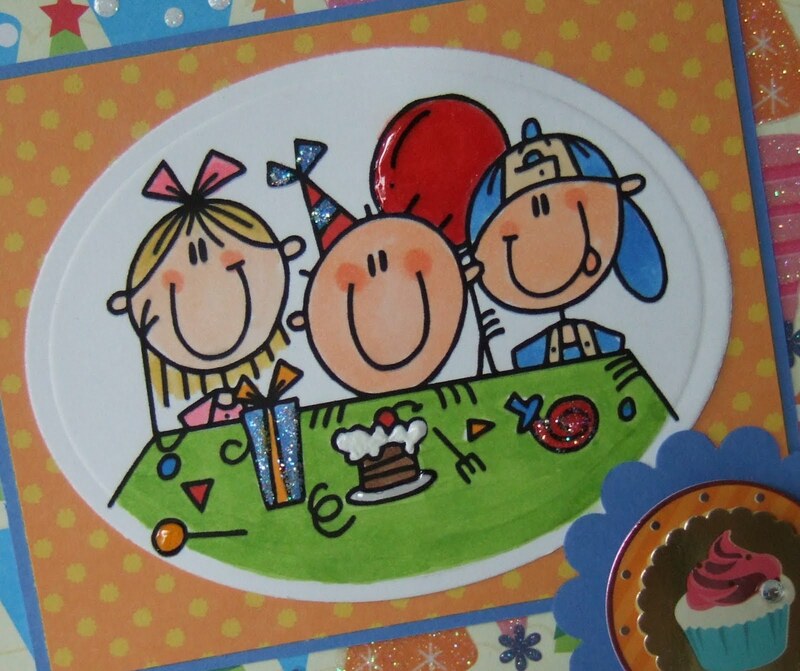 These are the perfect primary colors for these kids having fun at their party! I love that party hat paper too! Adorable! 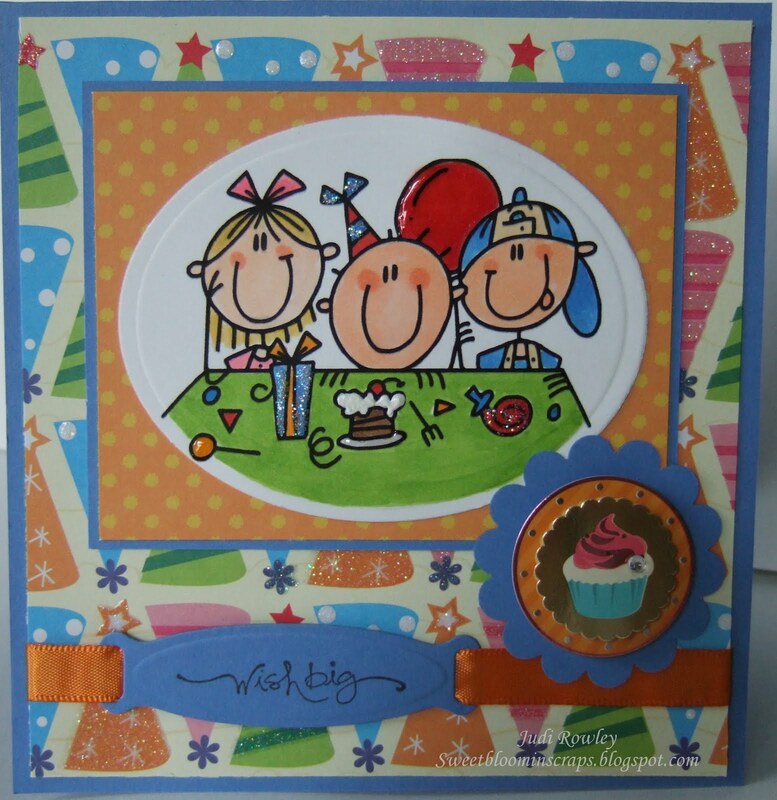 Judi - your card is so adorable! I love everything about it - the papers, your coloring is fab and I especially love that little cupcake embellie!!! sound like you all had a blast!! Love this image, sooo cute. love all the colors! Judi this is so adorable! I love what you did with the image - the sparkle, crystal effects and the colors. The absolute perfect paper for this image too. Hope your July 4 holiday was good. My family is in Wash DC on vacation and we saw some magnificent fireworks here tonight. Judi, this card is adorable! I love the party hat papers with this image!! They go so well with each other. Glad to hear you gals had a great time once again. Yikes 11 mini albums you girls were really busy!! You will have to share pics with us soon!